PROFAUNA's supporters and activists succeeded in raising money to buy a LCD projector for forest and wildlife education program. They collected up to IDR 4 million just in within a week or so. This donation will be given to PROFAUNA's activist in our Bukittingi Chapter who has been vehemently doing educational activities to schools and communities in West Sumatra, all voluntarily! To support the great works, PROFAUNA's founder, Rosek Nursahid, called on PROFAUNA's supporters and activists to raise some money to provide a LCD projector. Only a few hours after the appeal was launched, PROFAUNA's supporters already gave positive responses, and some of them even directly transferred their donation to PROFAUNA's bank account. 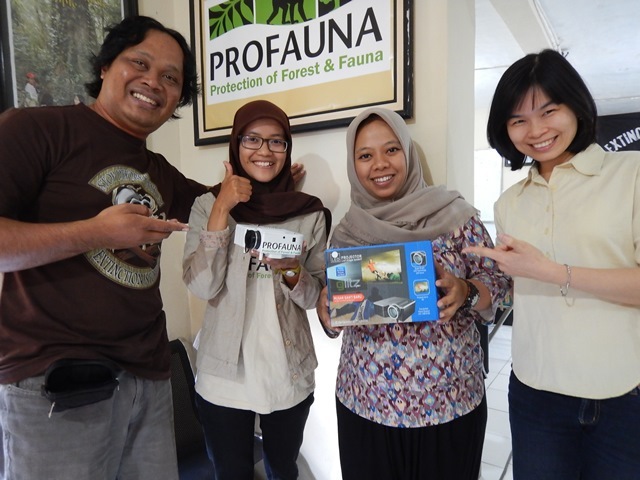 Not only in cash, PROFAUNA also received an LCD projector from Mr. X in Jakarta. He sent the projector soon as he heard about the appeal. The projector had arrived in PROFAUNA's Headquarters and on its way to Bukittinggi. The money raised from other people will be used to purchase another projector to be used in PROFAUNA's education program in villages close to forests. Thank you for your donation, PROFAUNA highly appreciate your concern.